Sometimes when viewing the optic nerve, it doesn’t look defined with nice, healthy neural retinal rims. There is not always a need to panic in these situations. Optic nerve anomalies can be harmless or they may significantly affect the vision. 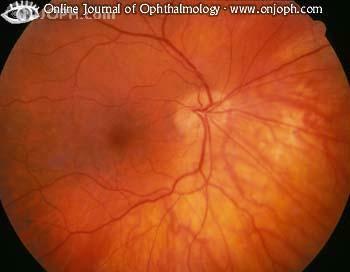 This article aims to summarise the main anomalies and diseases of the optic nerve. What does a normal optic nerve head look like? Normally, the optic nerve is around 1.5mm in diameter horizontally, it is either oval or round in shape and has defined margins with a pink neural retinal rim. It is very slightly raised with the middle area known as the cup dipping in slightly. Depending on the cup size and depth, the amount of centralized depression varies. I see this often and it is caused by the optic nerve entering the globe at an oblique angle. Tilted discs are usually bilateral but can be unilateral. These do not typically affect the patient’s vision. However, it is always advisable to do a visual field test when you seen any tilted disc as they may have a superotemporal visual field defect that doesn’t obey the vertical midline. 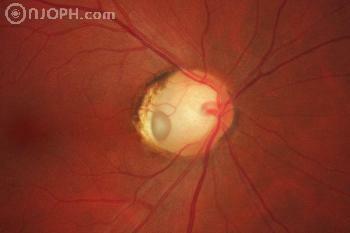 The optic nerve itself appears larger than normal with a temporal (sometimes central) round or oval pit. Visual acuity is not affected but patients commonly have a visual field defect which may appear glaucomatous. Also, although uncommon, patients who have temporally located pits may go on to develop serous macular detachment. The subretinal fluid is thought to come from the vitreous. This is an important one. I have panicked many times thinking I have seen papilloedema when it has been optic disc drusen. The appearance can be very similar and if there is ANY doubt, it is always best to refer. 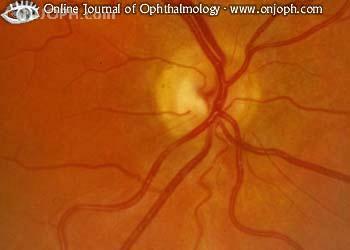 Optic disc drusen is an accumulation within the ONH of hyaline-like calcific material. This is very rare and significantly affects the vision. The optic nerve appears very enlarged and looks very deeply excavated. Centrally you can see an area of white glial tissue which is hyaloid remnants. There are more disc vessels than normal and they exit the disc in a radial manner. It is normally seen in one eye only (unilateral) but may occur in both eyes (bilateral). In 30% of cases, a serous retinal detachment may occur. This is an interesting one because ON hyperplasia can be present in a normal or a very abnormal eye. A hypoplastic optic nerve has fewer nerve fibres than a normal eye. Substances such as quinine, LSD, alcohol, protamine zinc insulin, diuretics ,steroids, anti-convulsants and cold remedies used by a woman during pregnancy is associated with optic nerve hyperplasia. As this condition can occur in normal eyes, visual acuity may or may not be affected and varies significantly from normal vision to no perception of light. The optic nerve appears small and grey and has a ‘double ring sign’ which is where the outer ring is a yellow area of hypopigmentation (also known as concentric chorioretinal atrophy). This outer ring represents the actual size of the optic nerve if it were to be normal. In some cases, only part of the optic nerve is hypoplastic and this can be mistaken for a myopic crescent or tilted disc. If the distance from the fovea to the optic nerve is > or equal to 3 DD, this is another indicator of optic nerve hyperplasia. The disc vessels appear normal if not a little tortuous. Depending on whether the eye is normal or abnormal, other features may occur such as VF defects, RAPD, colour vision defect (dyschromatopsia), foveal hyperplasia, microphthalmus and aniridia. In severe bilateral cases, strabismus and nystagmus may also be present. Optic nerve coloboma’s often affect visual acuity and it is important to identify these because they have significant systemic implications. They occur due to the embryonic fissure failing to close and can be unilateral or bilateral. It appears as a very distinct almost glistening bowl shaped excavation. The disc may be larger than normal but the retinal vessels appear normal. It is rare and can occur sporadically or is occasionally hereditary. There is always a superior visual field defect which can be confused with normal tension Glaucoma. The patient may also have micropthalmus or an iris, ciliary body or fundus coloboma. There is risk of serous or rhematogenous retinal detachments. The main thing to be aware of here is the systemic implications. Patients may have chromosomal anomalies including Edward, Patau or Cat-eye syndrome. They may also have heart defects, choanal atresia, retarded growth and development as well as genital and ear abnormalities. Other syndromes associated with optic nerve coloboma include Meckel-Gruber, Goltz, Lenz microphthalmos, Walker-Warburg, Goldenhar, Dandy-Walker cyst and Rubinstein-Taybi. 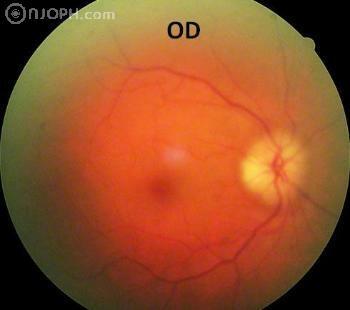 This can be caused by inflammation, infection or demyelination of the optic nerve. Demyelination is the most common cause. A parainfectious cause may occur due to a viral infection or immunisation whereas an infectious cause may be due to a sinus issue or other infection such as syphilis, lyme disease and cat-scratch fever. Signs of optic neuritis are sudden vision loss – commonly a central scotoma, decreased contrast and colour sensitivity, pain on eye movement, oedema of the optic nerve and an afferent pupillary defect. We need to be aware of the classifications because they all have different systemic associations. A common condition associated with demylination of the optic nerve is multiple sclerosis (MS). MS is a disease of the central nervous system where there is demyelination of nerve fibres. Demyelination can occur anywhere in the body, causing neural and muscular impairments which can be mild or severe. Patients usually present between the age of 20 and 40. Often the optic nerve appears normal in these patients, known as ‘retrobulbar neuritis’. They will experience the other symptoms such as pain on eye movement, visual loss and sometimes a frontal headache/tenderness. 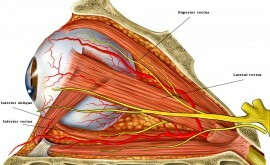 A detailed article about optic neuritis will be available in due course. Papilloedema is swelling of the optic nerve, secondary to raised intracranial pressure. It is very serious and patients who present with this should be suspected of having an intracranial mass and referred immediately. Symptoms include headaches which often occur in the morning and get worse throughout the day, nausea and vomiting, unconsciousness, significant visual disturbances and diplopia. However, it is also important to be aware that papilloedema is not always caused by an intracranial mass. This can be referred to as ‘idiopathic intracranial hypertension’ and occurs in young, obese woman. The symptoms are the same as papilloedema but investigative techniques such as lumbar puncture and neuroimaging show normal findings. This is a medical emergency and is potentially a sight and life threatening condition. It is commonly referred to as Giant cell arteritis (GCA). It is caused by inflammation (vascularitis) of the small and medium arteries around the head especially the superficial, temporal, ophthalmic and posterior ciliary arteries. Risk factors include hypertension, diabetes and hypercholesterolaemia (carotid artery disease). The patient’s vision may become severely affected if the blood supply to the eye is affected. Patients tend to present with symptoms when they are between the age of 60 to 80. Symptoms include sudden and painless vision loss, jaw claudication, scalp tenderness and headache, weight loss and fever/night sweats. Examination may show tenderness and pulsation of the temporal arteries. 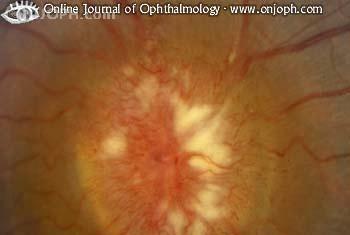 The optic nerve appears swollen and very pale or ‘chalky white’. A flouroscein angiogram shows hypoperfusion of the choroid. It is very important to refer immediately if you suspect GCA. Patients need a temporal artery biopsy as soon as possible. Patients are treated with steroids to decrease the inflammation even before diagnosis is confirmed. This is done because if the patient does have GCA, immediate steroid use helps preserve the sight in the remaining eye. Although uncommon, GCA sometimes causes a central retinal occlusion and if this is suspected, there may be a relative afferent pupil defect. Another sign of this is the macula appearing as a ‘cherry red spot’. This is not a good sign and often means it is too late to save the vision in the eye. 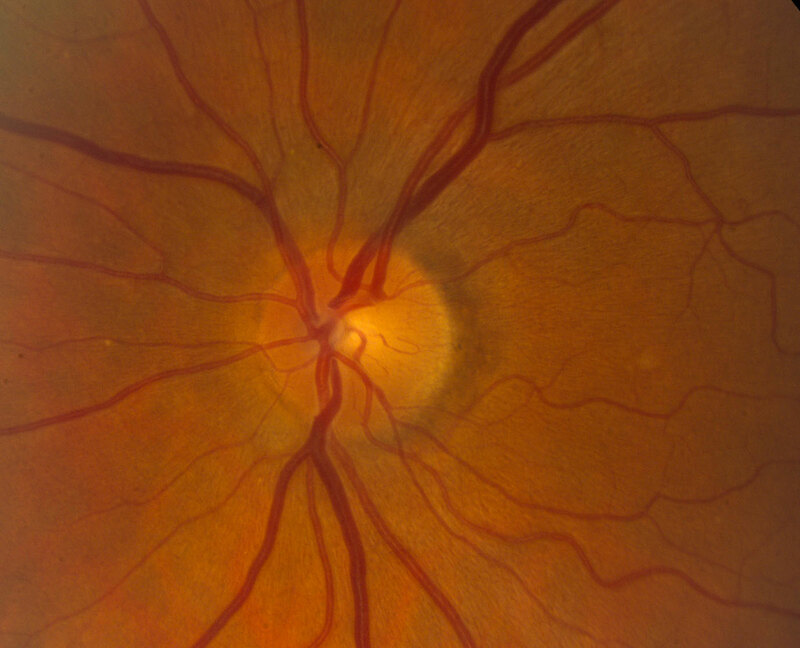 The red appearance is because the underlying choroidal vessels are now visible through the thin and pale macula where the retina is at it’s thinnest. Medication such as beta blockers or carbonic anhydrase inhibitors may be required to reduce the IOP which can build up due to oedema, secondary to the blockage. NOTE: If the patient presents within 24 hours of a suspect central retinal vein occlusion, ocular massage may help to dislodge a potential embolus and cause a branch retinal vein occlusion instead of a central retinal vein occlusion, saving the sight. This is the most common type of optic neuropathy in the elderly. It is caused by an occlusion of the short posterior ciliary arteries causing either a partial or total infarction of the optic nerve. One major risk factor is having a ‘crowded disc’ and the more elderly the patient, the more crowded the disc becomes. Other risk factors include hypertension, diabetes, high cholestoral, collagen vascular disease, sudden hypotensive events, sleep apnoea and taking sildenafil (viagra). Patients present between the age of 55 – 60 and complain of sudden, painless, monocular vision loss. An altitudinal visual field defect may be present as well as a colour vision defect. The optic nerve appears pale with peripapillary splinter shaped haemorrhages. There is no specific treatment apart from controlling the systemic associations. Aspirin is given to reduce further vascular events but has not proven effective at preventing the other eye becoming involved. 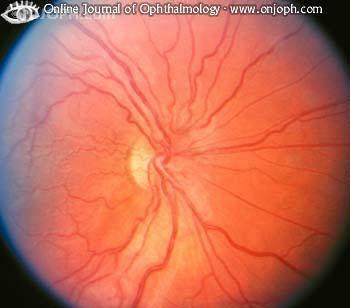 Optic neuropathy may be caused by drugs such as Ethambutol, Amiodarone and Vigabatrin. Ethambutol helps treat tuberculosis. It can be toxic on the eye though and causes side effects such as optic neuritis, colour vision anomalies and visual field defects. 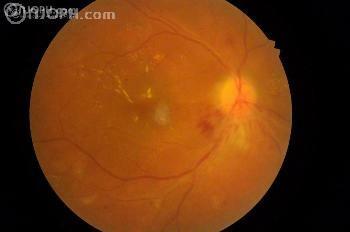 The optic nerve may appear swollen with splinter haemorrhages. There may be a centrocaecal scotoma although it is possible to have bitemporal or peripheral constriction. Once Ethambutol treatment has ended the vision is likely to recover although it takes up to a year. Occasionally permanent vision loss occurs due to optic neuropathy. Amiodarone has a few systemic and ocular side effects. It is used to treat cardiac arrhythmia. Side effects include thyroid dysfunction, pulmonary neuropathy and gastrointestinal. A common ocular side effect is Vortex keratopathy (swirls on cornea) and less common side effects are anterior subcapsular lens deposits and optic neuropathy. Optic neuropathy presents itself by either vision loss in one or both eyes. The optic nerve appears swollen and remains this way for a few months after the medication is stopped. This therefore negatively affects the overall visual outcome. Vigabatrin is used to treat epilepsy. 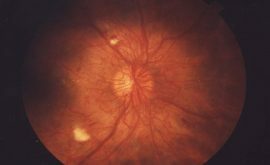 Ocular side effects are rare but include bilateral concentric or binasal visual field defects, nasal optic disc atrophy, arteriolar narrowing and abnormal macular reflexes. Injury to the optic nerve can be direct or indirect. Direct occurs from penetrating or blunt trauma. Examples include orbital fractures associated with mid-facial fractures. 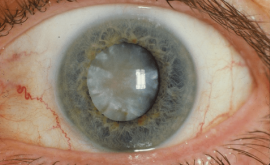 Injuries include optic nerve transection, avulsion, orbital haemorrhage, orbital emphysema or optic nerve sheath haemorrhage and are diagnosed by ophthalmoscopy or imaging techniques. More commonly, indirect optic nerve injury can occur. This is typically caused by the force of a head injury. This transmits a shock wave through the orbit and causes optic neuropathy. Frontal head injuries which cause loss of consciousness more often cause vision loss but occasionally a mild bump can cause significant damage also. In these cases, initial examination appears normal apart from a possible relative or absolute afferent pupillary defect. They may also have a variety of visual field defects. After 4-6 weeks post trauma, optic atrophy develops. Although this is a rare condition, it is important to be aware of it. It is caused by a maternal inherited mitochondrial DNA mutation. It usually presents in males between the ages of 15 to 35 but occasionally occurs in females aged 10-60. 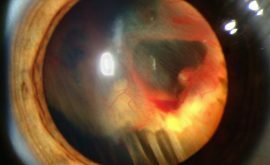 Patients complain of unilateral, painless but severe central vision loss. Very sadly, the other eye normally becomes involved a few weeks or months after the first. Initial examination may not show a great deal where the optic nerve looks normal. 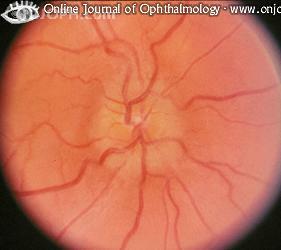 However, often there is optic disc hyperaemia with hazy disc margins. Telangiectatic microangiopathy may also be present and this is when dilated capillaries are on the optic disc and they spread out onto the adjacent retina. This in turn causes pseudo-oedema due to swelling of the peripapillary nerve fibre layer. The telangiectatic vessels then regress, resolving the pseudo-oedema. At this stage severe optic atrophy occurs. VA is usually 6/60 at best and the prognosis of this condition is poor. Several treatments such as steroids, hydroxocobalamin and surgery have been attempted, but nothing has proved successful.